Eye Magazine | Blog | Cool for (copy) cats? This seemingly effortless poster by Abram Games, along with its ham-fisted imitator, is one of a riveting set of graphic design images assembled by Bob Caruthers, writes Sally Jeffery. 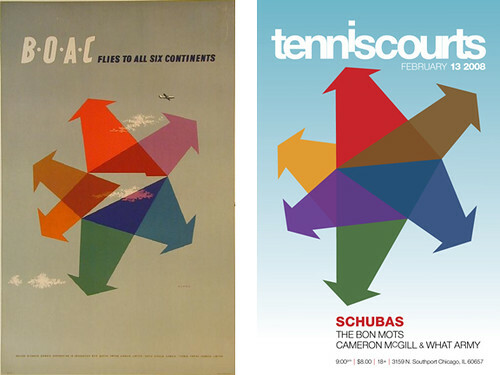 Top: Abram Games poster (1956); concert poster (2008). Below: Rafal Olbinski (1982); concert poster (2002). Half banana / half woman (distant and disreputable relative of Half Man Half Biscuit?) could be a case of two designers having the same fantasy independently – Caruthers says that he makes no judgements. He does, though, offer a scale of culpability, from accidental similarity to outright plagiarism. Somewhere in between lies inspiration, where ‘the errant designer was well aware of the original source and used it as the basis of their design, but changed it enough to sorta make it their own. Some are more “inspired” than others.’ He cites this repurposed Bob Gill design. 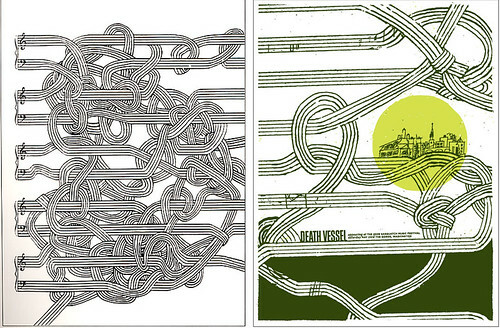 Above: Bob Gill (1962); concert poster (2009). Above, right: Homage to the King (1956) designed by Ray Lowry, 1979. Music features strongly in this collection. 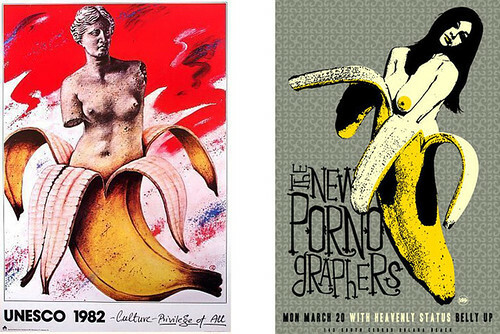 Students learn by looking, and they also design a lot of gig posters – but not all gig posters are done by students, and a grown-up passing-off habit looks like just another attempt to grab free money. The music business has its own homage / rip-off entanglements, with the court cases to prove it, and academia routinely runs written submissions through anti-plagiarism software. Questions of ownership are not always straightforward, but if it looks like a rip-off it probably is. If your motives are honourable why not add a credit? ‘Designed by —— after ——’ would do it. And if you don’t, one day Bob Caruthers will find you. See Bob Caruthers’ ‘Similarities’ Flickr photostream.